Sidharth Birla, Chairman of Xpro India Limited and DigJam Limited, and Past President of FICCI, explains the prevalence of the peculiar term “indigenous angle” which was used to obstruct companies from getting clearances and licenses under MRTP, and how such bureaucratic processes were often impervious to facts. I think, you know license raj and MRTP went sort of hand in hand because really speaking you could even by 1991 start smaller ventures without the rigours of a license. It was only for the larger ventures that you required a license or it is where natural resources were required or huge amount of imports were required. So that went away. I think that the license raj removal was equally, it was equally important that a lot of import regulations got rationalised in 1991. So not only did you have the freedom to manufacture and others but if there was some foreign exchange balancing because in 1991 we really came out of a bad forex crisis and that was the origin of 1991. The license has been partly replaced by regulatory mechanisms which is also very essential because you cannot have a free market without regulatory intervention, okay? So telecom needs a regulator, energy needs a regulator and there has to be a regulator in every area. Stock markets need regulation. So, license raj has been sort of replaced at the market end because license raj was at the supply end. The regulator is at the market end really speaking. So that shift has taken place which is I think a very desirable shift. We used to go running around to DGTD, the Directorate General of Technical Development in Udyog Bhavan. If you needed a license, if you needed a registration, if you needed to import capital goods, if you needed to import raw material. There used to be very unique terms called ‘Clearance from Indigenous Angle’, okay? So that was an angle. So I used to take this brand new idea and the industrial adviser would tell me “It would have to be cleared from the indigenous angle.” And I used to say “What does it need clearance for if it isn’t made in India?”, “He said, no but it’s a process so we have to do it”. But he used to enjoy. So I had got into that kind of thing. So I didn’t probably face as much of a brunt as some of my seniors did. But every area that I went into, you know whether it was for example a, today you cannot launch a new company without a track record it to the stock market. At that point of time the government had a philosophy that we want to expand ownership and trigger the stock market. So even if I wanted to own 100% of my business, I was actually forced, I was told that I cannot own more than 40% of my business and 60% of my shares must go to the market. So already the seeds of good ideas in terms of expanding the financial markets and all had started coming in. But we were too bound by rule writing. So I have seen lot of all this chaos happen. So if you hired labour that is what you had to do. We were not very, I would say, conscious about being efficient in terms of labour practices because people were always available. So if somebody actually used to offer us machines at that point of time, “The machine is coming from Germany”, they would offer us a certain level of automation and our mind would go back to saying, but for the cost of one machine I can hire one guy for three years. 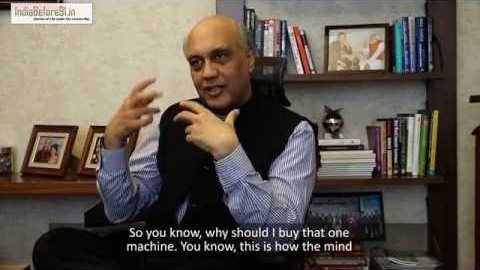 So you know, why should I buy that one machine. You know, this is how the mind used to work in the years that I started business. At the same time my own product had a lot of automation inbuilt into the process, so I could not avoid it. So I think I had a different start from a lot of people who were getting into business at that time. The government policies and the mental thinking kept our sizes so small that we could not develop it into a huge employer. Because India needed a very very vibrant textile industry to take share of the global trade and to provide employment in terms of garment manufacturing and all. Now I think we are too late into the race because our cost of labour has gone up and all the low cost countries have taken it away. So textile never found its place in the economy as it should have.